SES tablet delivery systems are made in a wide variety of sizes to meet any chlorination need or requirement. 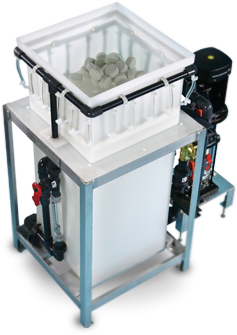 With few moving parts, the chlorinator systems offer low maintenance and minimize the possibility of spills or leaks. Accu-Tab® tablets offer a more neutral pH level and are less corrosive than other chlorination methods. Only three inches in diameter, the tablets are easily dropped into the chlorinator and allow for easy storage. 1/4 pound of granular cal-hypo is required for each 1,000 gallons of total chiller capacity in order to bring the "pre-bird" (clean water) residual chlorine level to 20 PPM. Example:20,000 gallon chiller = 20 x .25 = 5 lbs of granular cal-hypo to equal 20 PPM.